When I was working on my office, I knew I wanted to find a way to display two collections. One was my Red Rose Tea figurines and the second was china thimbles my MIL has brought back from various trips she’s taken. The thing about both of these collections is that they’re small. I had the shelves of the china cabinet where I could tuck in a few thimbles or figures, but they’d be lost amongst the bigger items on display. I also didn’t want them on a tabletop where they took up space that could be a work surface. I decided to do two small shelves. First was a small floating shelf for the thimbles. This shelf was so small and the thimbles are so light that I knew it wouldn’t need much support and I could screw it right to the wall. I cut a piece of 1×2 to the length I wanted and then drilled two holes through the face of it. 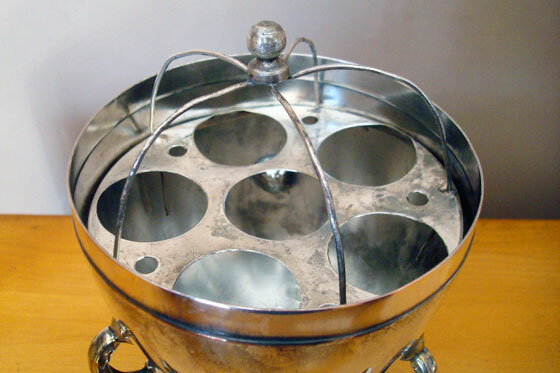 The holes served two purposes. The first was to make sure the shelf didn’t split when I screwed it to the wall. The second was to recess the heads of the screws. I made the holes slightly bigger on the front so that the screws would go into the shelf by about a quarter of an inch. I painted the shelf the same colour as the wall and then screwed it into place. Then I filled the holes with woodfiller and painted over them. 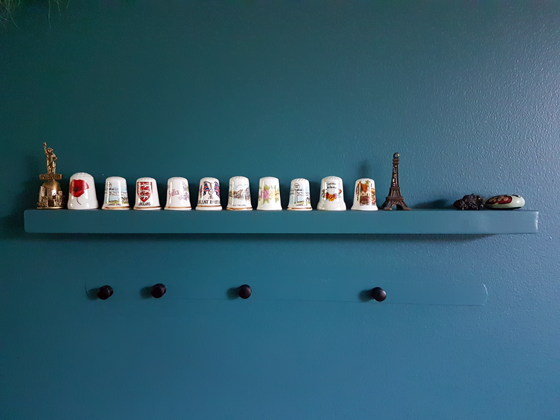 The shelf blends into the wall very well, so that it (almost) looks like the thimbles are floating. The second shelf is ingenious, but I can’t take credit for it. I found the idea on The DIY Mommy. This shelf started its life as a cutlery tray. I lopped off the one segment that ran perpendicular to the others on my Dad’s tablesaw. Then I painted it white, and simply screwed it to the wall. It is exactly the right size for my collection of nursery rhyme tea figurines. I love having different things hanging on the wall, rather than the usual pictures and paintings. These two collections have a lot of meaning for me. 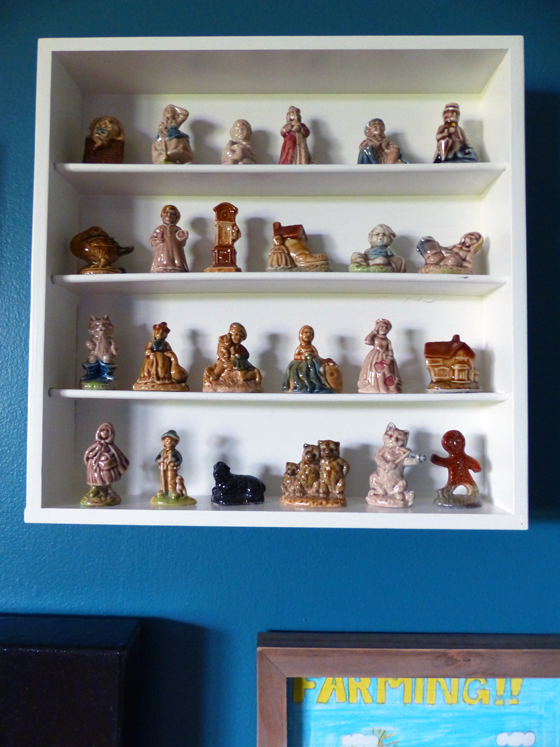 Memories of the tea figurines that lived in my grandmother’s china cabinet, appreciation for my mother-in-law thinking of me and my love of sewing when she’s traveling. Do you have any small collections? How do you display “smalls”? Have you built any tiny shelves? 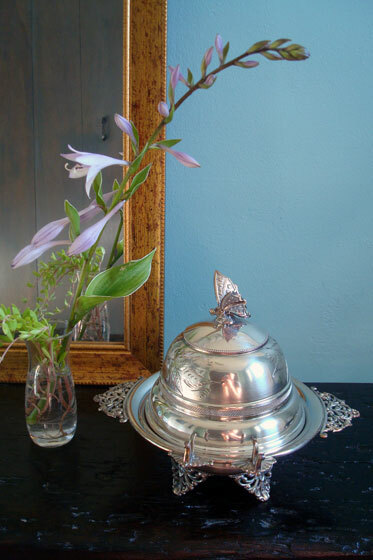 I love pretty dishes and special serving pieces. I do my best to pull them out regularly and not leave them shut up in a cupboard. 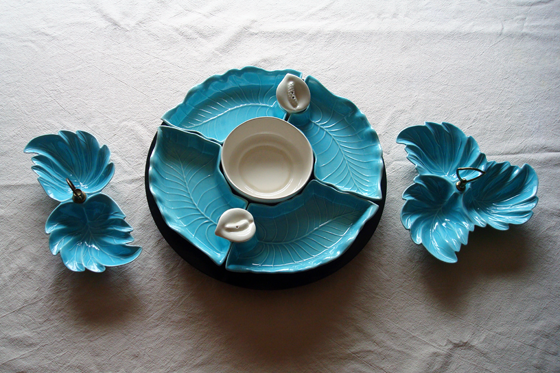 This set of blue leaf dishes is particularly special to me. They came–kind of–from my grandmother. 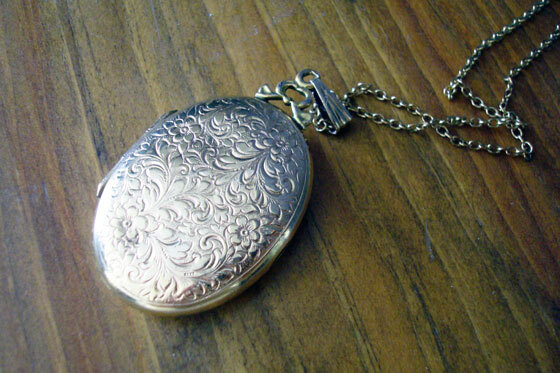 I say kind of because only one piece–the one in the centre–actually belonged to my grandmother. My grandmother entertained regularly, but I only remember seeing her use the blue dish once. 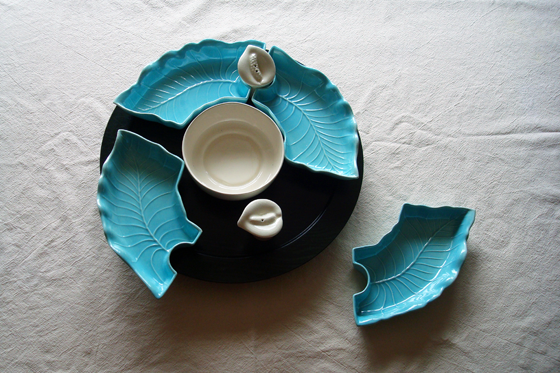 It is made up of four leaf bowls, one round bowl and a pair of leaf salt and pepper shakers. They all fit together and sit on a lazy Susan. Despite only seeing it once, it made an impression on me. I love the colour and the form of the leaves and the way it all joins together. 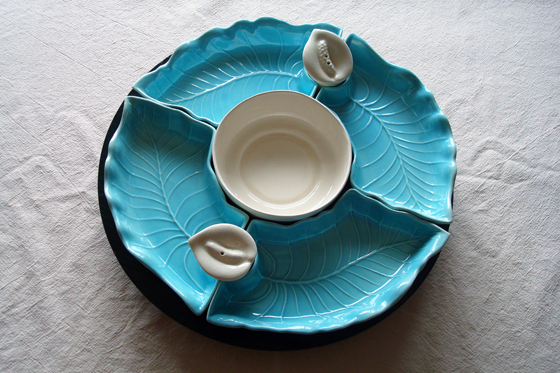 When I was in university I went to an auction and all of a sudden a familiar looking blue leaf dish was on the block. It was three leaves joined together with a little handle. I bought it (probably for less than $20) and excitedly showed it to my grandmother. My Grandma was a very organized, very practical woman. When she died, items throughout her house were labelled with the names of who should inherit them. My name was on the blue dishes and their lazy Susan. 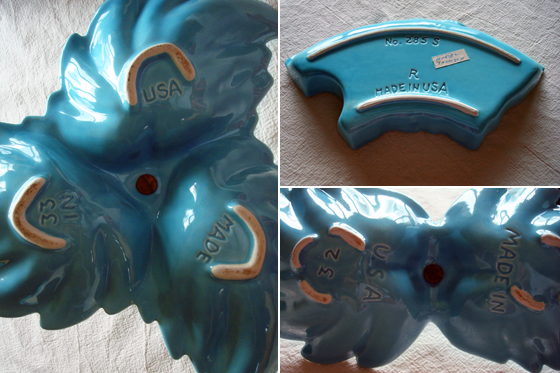 A few years later, I found another dish at a flea market. This one was a pair of leaves with a little handle. I hesitated, but eventually made my way back to the vendor and bought the dish (again for less than $20). I’m so glad I did because I haven’t seen one since. 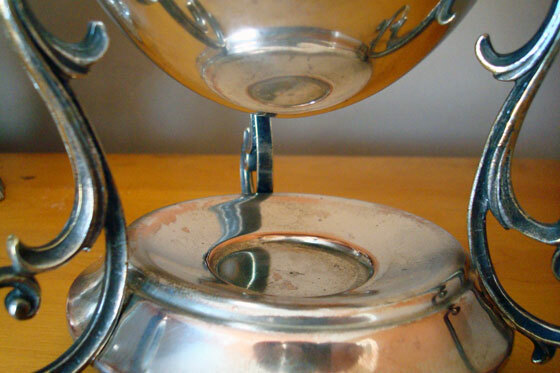 There’s not a maker’s name on the underside, though they’re obviously all made by the same manufacturer. My grandmother’s set has her name on a fabric sticker on the bottom of each piece, a throwback to when she would take the dishes to church suppers. I love that I’ve been able to amass a little set on my own. And I love putting them to use. 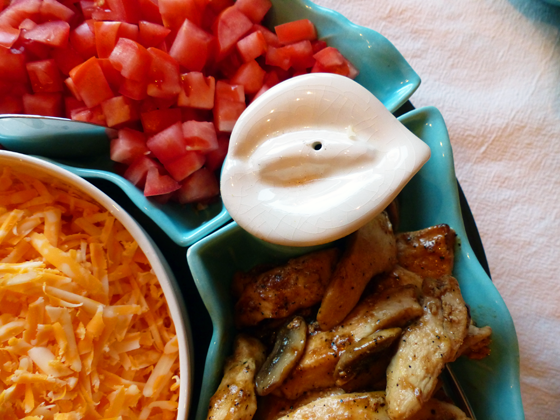 They are perfect for Mexican night, when each dish is filled with its own ingredient. 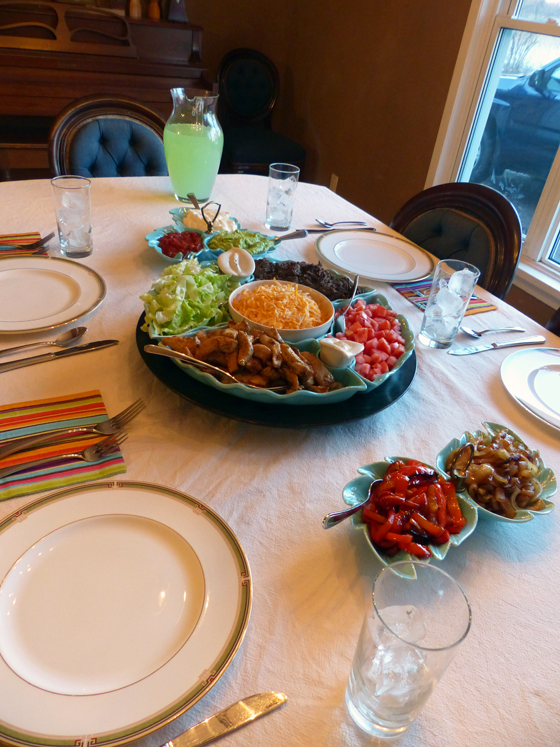 Set on the lazy Susan in the middle of the table, the big piece spins around so people can build their own tacos without having to constantly pass bowls around the table. 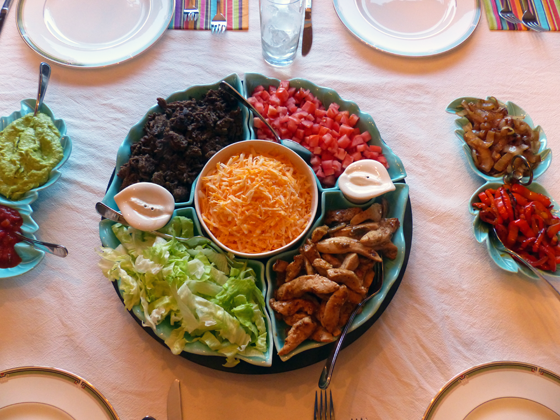 We’re making our own memories with these dishes. Even though only one of them officially belonged to my Grandma, they all make me think of her and feel more good memories. Who else loves dishware? Do you have any sets that you’ve collected over time? 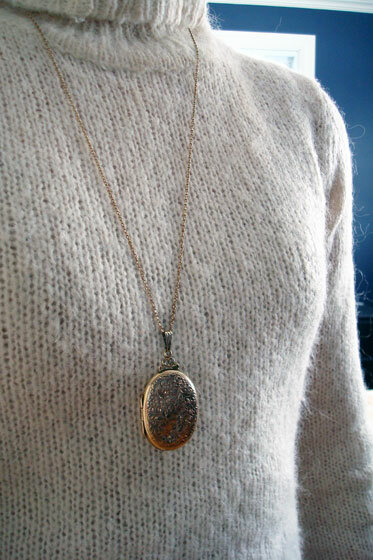 Or do you have any special pieces you’ve inherited? I didn’t really have project this month, but I did say that I wanted my books back. That meant finishing the bookshelf makeover that I started in August. 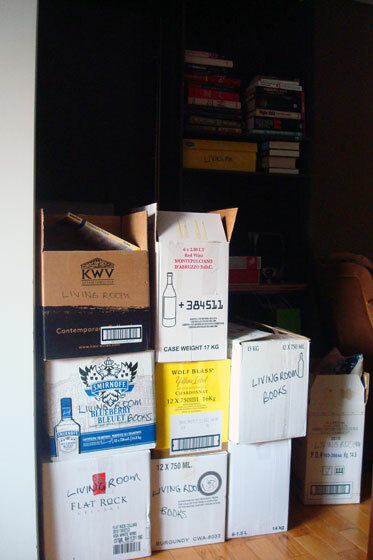 You might recall that in my original photo you could barely see the bookshelves because they were painted such a dark brown (oh, and hidden behind boxes that have been packed for two and a half years). Well, not anymore. Behold the view from the same angle. Bright and white and, best of all, filled with books. Hello beloveds. 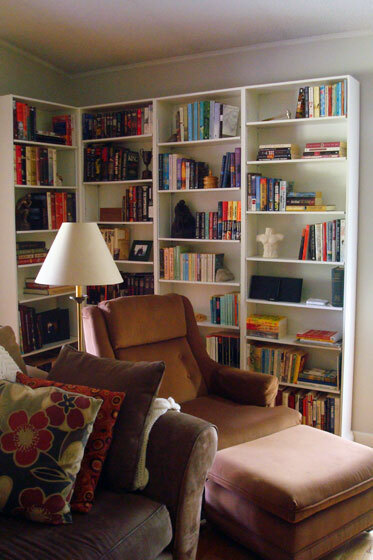 The bookshelves wrap the one corner of the living room and tuck behind the comfy lounging chair that I inherited from my grandmother. I’m pretty happy with how things have come together. I know a lot of people struggle with styling bookshelves, and I’m no different. I’m decently satisfied with the middle section right now. As always, the contents of the shelves have a lot of meaning for us. Besides the books we have some very special treasures. The trophy is Matt’s grandma’s won for a school running race in 1935 when she was in high school, my dad made the small lidded wood pot on his lathe, and the hammer on the top right was a gift from my grandmother to Matt and unscrews to reveal decreasing sizes of screwdrivers. Towards the bottom, we have a brick I found in the backyard of our first house that has our city’s name stamped on it. Below that there’s a picture of Matt and me at Niagara Falls back when we first started dating, and beside that a miniature replica of Rodin’s The Kiss. (Rodin is our favourite sculptor. A miniature of The Thinker is on an adjacent shelf). The half naked man (or more accurately naked half man) was a high school art class project. I want to tuck a few more knick knacks in some of the empty spaces, and I definitely need to get some bookends. I’ll continue to futz with the arrangement, but regardless of what things look like, I’m thrilled to have my books back. Little Green Notebook’s super tall custom bookshelves. 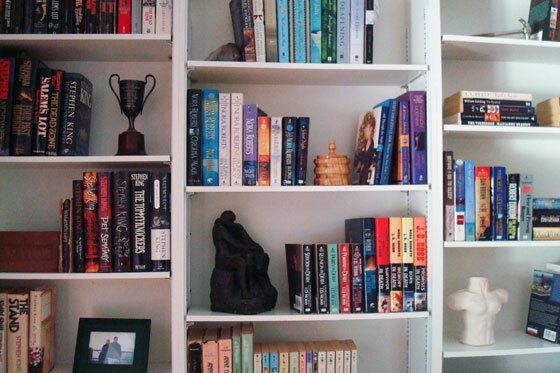 Talking about arranging bookshelves, Jenny’s are a great example. Nicely balanced, but not rigid or linear. Have you heard about the Year of Change? August’s project was to style bookshelves. I cannot explain how thrilling it is to have my books back. I came across a few I’d forgotten I had and of course lots of old favourites. In fact the borrowed book that I was half-way through may have been set aside in favour of an old favourite. (I never do that. I’m always a one-book-at-a-time woman). Plus, setting up the bookshelves gave us an excuse to paint some more of the living room and unpack about 16 boxes that had been piled in the corner. The room feels so much more finished! … Well, we’re still a long way from finished. At least it’s a little bit closer to the vision in my head. 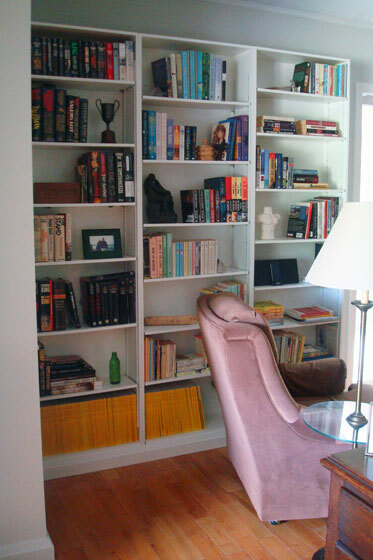 How do you handle book storage at your house? Besides books, what’s on your bookshelves? Any tips on styling bookshelves? Who else is a one-book-at-a-time reader? Last week I happened to be over at my parents,’ and my Mom said she had received a notice to go to the post office to pick up a package for me. We were both pretty curious. It’s been awhile since I received mail at my parents’ address. As soon as we saw the return address on the package, we knew what it was. My Mom’s friend had made me a quilt. In her wonderful cover note, she called this a nephew quilt. I am a very proud aunt to four fun boys. Two of them are brand new, born just this year. The design is based on a tabletop quilt by Kay Harmon called Springtime Frolic. My Mom’s friend saw it in the Primitive Quilts magazine this spring and then adjusted the pattern to make it a bit larger. The workmanship, the piecing and the quilting are absolutely beautiful. 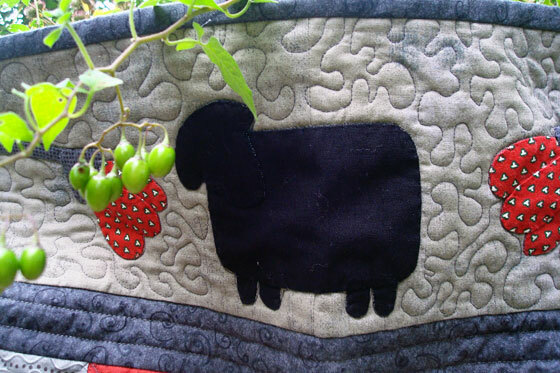 The parts I like best are the squiggle quilting (I don’t know the proper term for it) around the outside edge and, of course, the one black sheep. I’m choosing to associate myself with this guy since I like to be a little bit different and stand out every so often. Besides, I cannot cast one of my nephews as the black sheep. I feel so honoured that someone took the time to make something by hand specifically for me. 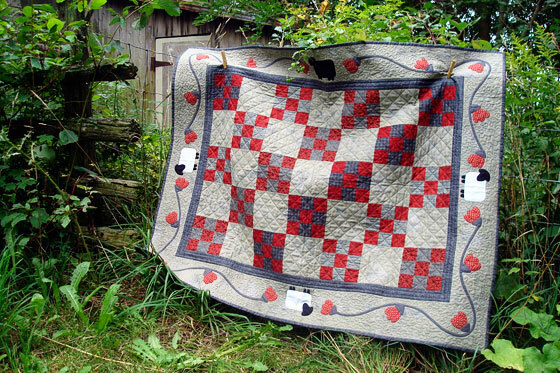 Plus, it just seems right that we have a handmade patchwork quilt at the farm… especially one with livestock on it. This is a very special gift. Thank you, Mary. Anyone else have a homemade quilt at their house? Or are there any quilters out there? I’m a sewer, but I’ve never tackled a quilt, and I admire those who do. I had been to auctions before. My Dad enjoyed them, and it was a cheap activity to do with little kids. These were country auctions. Outdoors. At farms. There were usually wagons and trailers spread over the yard piled with boxes that themselves were piled with goods for sale. At this particular auction, there was a wagon full of cartons that seemed to have been packed in the kitchen. There were dishes and spatulas and gadgets. 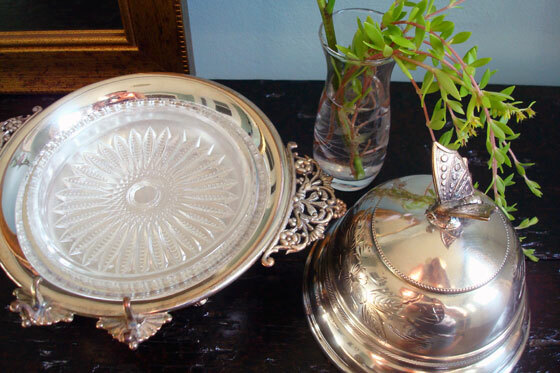 One box was full of tarnished silver dishes. I was young, maybe just a teenager. 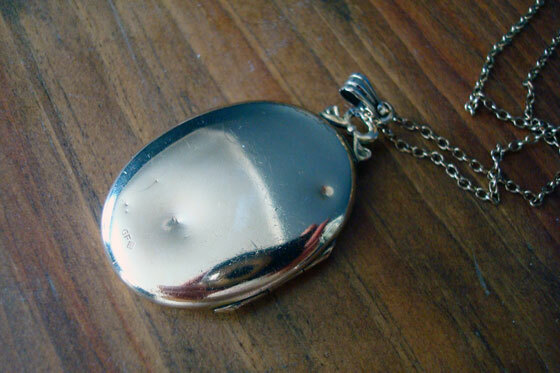 But I’d started collecting a few silver pieces. This box had a dish that I wanted to add to my collection. 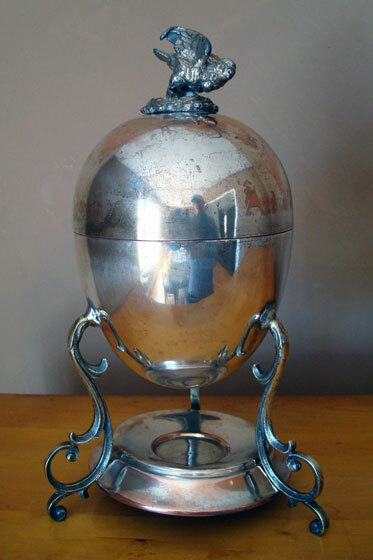 It was a silver butter dish. 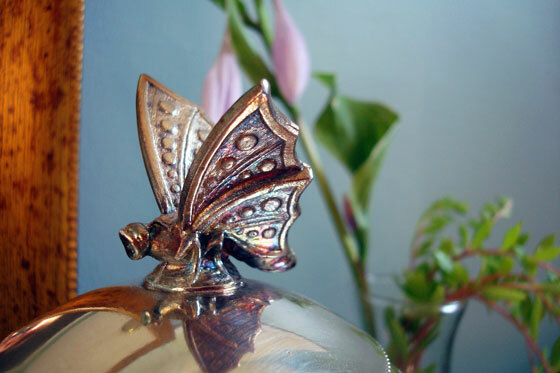 What made it special was the lid, which was capped with a butterfly. My Dad agreed that it was pretty, and he said he’d bid on it for me. The auctioneer circled around the wagon, selling off boxes one at a time. Then, he pointed his cane at my box. One of his assistants picked it up. The bidding was on. My eyes shot back and forth between the box and my Dad. The assistant reached into the box and pulled out a dish and held it up for people to see. 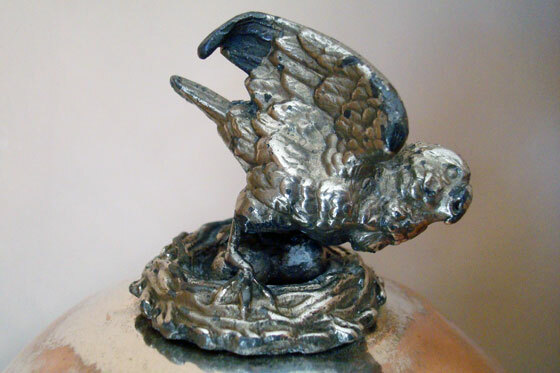 The auctioneer kept chattering, calling the next price, driving the bidding on. The assistant pulled another dish out of the box. It was the bottom of the butter dish. My Dad looked at me. He said, “Are you sure that’s the one?” Nearly frantic, I nodded yes. He bid. The price jumped maybe twice more, and then the box was mine. We came forward to take the box and moved off to the side so that we could look at what we bought. The butter dish, including the lid, was there. Inside, I was gleeful the assistant had only held up the bottom of the dish and not the lid. I was grateful that my Dad had trusted me that this was the box. I was thankful the price hadn’t gone too high (I think my Dad paid just either $20 or $50 for the box). I was excited the butterfly was mine. I’m still all of those things. 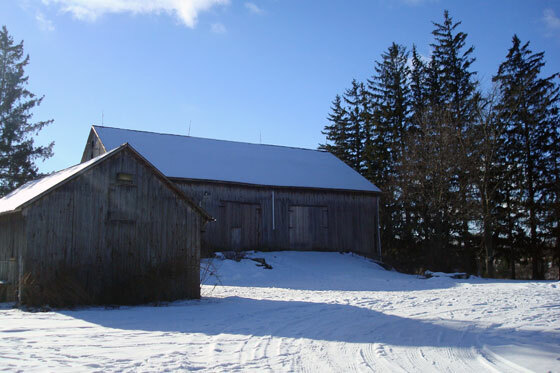 Rumour has it that one night in my grandparents’ apple orchard, there were some thieves stealing gas from the tank my Grandpa kept for the tractors. My uncle–who was a salesman and not the first person I would choose as a defender (no disrespect intended to Uncle Bob)–went out to run them off. 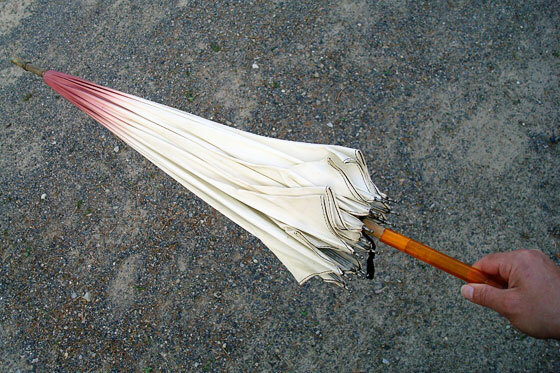 This umbrella is what he took as his weapon. The gas incident was well before I was born. Eventually, this umbrella made its way to my grandparents’ cottage. Every so often, it would be pulled out on rainy days so that people could make their way back and forth between cottages. When my grandmother sold the cottage, the umbrella became mine. The April issue of Country Living magazine featured vintage umbrellas, including one that looked a lot like mine. 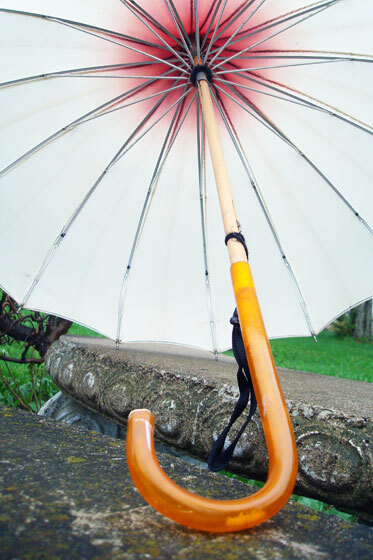 The shape is called pagoda, and according to CL, “Asian-inspired shapes generally indicate an older piece.” Given its illustrious family history, my umbrella is obviously somewhat old. The umbrella in the magazine was made in Montreal. That Canadian lineage makes me wonder if mine might be related. 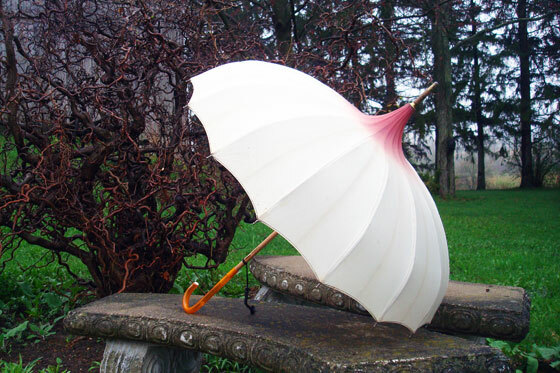 I saw another umbrella very similar to mine at an antique show on the weekend. It was even rose ombre but reversed with the pink on the bottom and white on the top. The tag said it was from Montreal too. It was priced at $80. Country Living valued their umbrella at twice that–$160. I’m not sure that mine is worth that much, but maybe it’s about the price of a tank of gas–even at today’s prices. 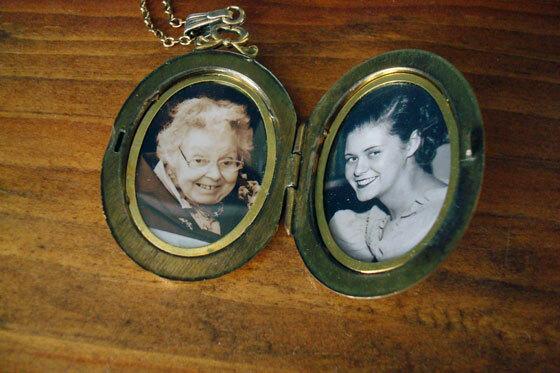 Do you have any family hand-me-downs with interesting pasts? 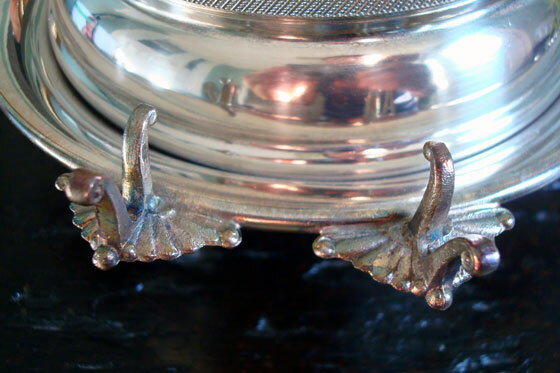 Have you ever spotted any of your heirlooms in a magazine? 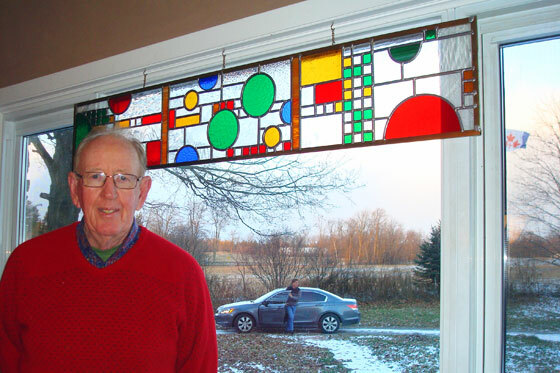 Matt’s grandpa was a painter. It was his hobby, and he was very skilled and prolific. Everyone in the family has a few of his works. 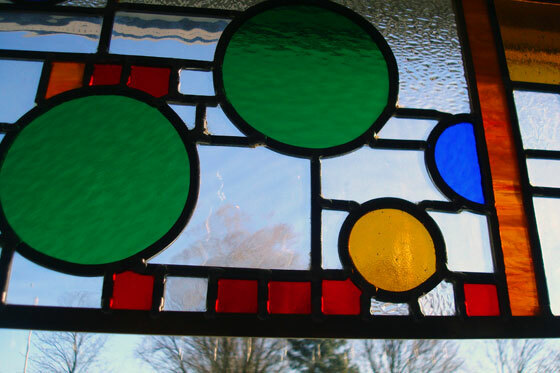 This summer, Matt’s Dad came across a piece, and he immediately gave it to us. For our Christmas present, Matt’s parents had the painting framed. It looks like it could have been painted at our farm. What makes this a truly uncanny back to the future moment is that there’s a stump right at the edge of the driveway where the big centre tree stands in the painting. 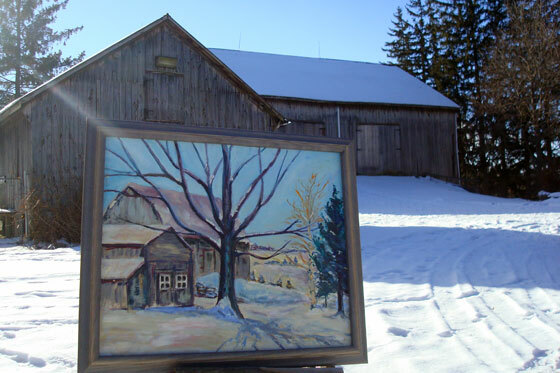 The small evergreens behind the barn ramp in the painting have now grown into our towering stand of pines. Matt’s grandpa died in 1991. I never met him. With this painting, it feels like he is a part of our life at the farm in a very meaningful way. Do you have any artists in your family? 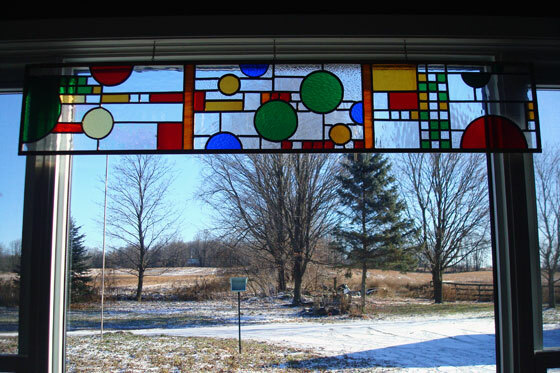 Do you have a painting of your house or property?